The first step in any leadership journey is leading yourself. Leadership STARTS with you. Effective leadership requires (DEMANDS!) that you lead yourself well, not only for your own sake, but for the sake of others. This isn’t about selfishness. In fact, it’s the first and most necessary step toward selflessness. It starts with leading yourself well, because any attempt to lead others well without leading yourself well typically ends up causing a great deal of frustration. Leading yourself is the foundation for any effort you make in leading others. The moment you step into any type of leadership role, the way you lead yourself helps others determine if you are a leader worth following. As they observe how you lead your own life, they’re thinking: Before I can trust you to lead me well, I need to trust that you can lead you well. Most people recognize the Golden Rule when they hear it. It goes like this, Do unto others as you would have them do unto you. I want to introduce you to a different rule, one that I call, The Rhodium Rule. Have you ever heard of Rhodium? Don’t feel bad if you haven’t. Not many people have. 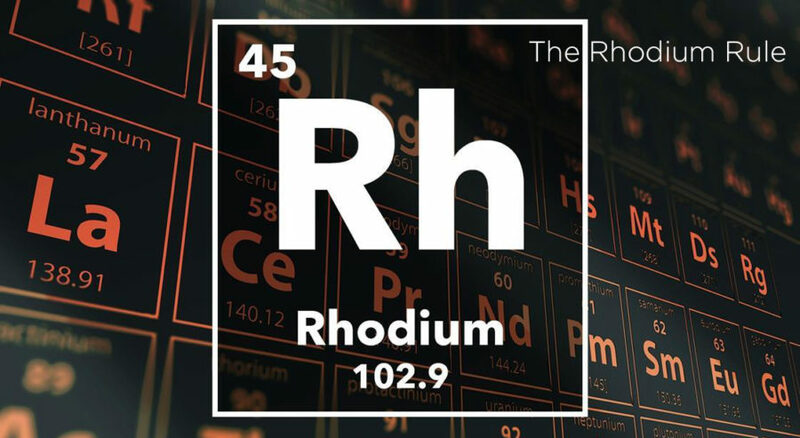 Rhodium is a chemical element (chemical symbol Rh and atomic number 45) listed among the most precious metals on earth (in between Platinum and Gold). It is often used as a coating on white gold to improve its luster and on sterling silver to reduce tarnish. It is one of the noble metals, meaning it’s highly resistant to the corrosion and oxidation which occur in most base metals. Most of all, Rhodium is extremely rare. Rhodium is added to other precious metals to help them look better, last longer, and enhance their personal qualities. That’s where the rule comes from. I asked my friend who is chemistry professor (we should all have a friend like that), “What’s so special about Rhodium?” He looked at me and said, “It’s more precious than gold…and it’s a catalyst.” Wow. It’s rare and it gets things going. That confirmed it for me! Do unto yourself what will inspire the best in others. Do unto yourself… The Rhodium Rule is at the heart of leadership that starts with you, but isn’t about you. One of the differences between my rule and the Golden Rule is who it starts with. The Golden Rule starts with an emphasis on others. The Rhodium Rule encourages you to start with yourself. It’s the motive behind what you do to you that makes it about others. The way you personally live, work, grow and lead can serve as an example that encourages the best in others. What will inspire… You work hard to create the best version of yourself so you can inspire others to be the best they can be. It’s not about dictating your demands or forcing people into a certain mold of your choosing. You don’t use your power or position to manipulate people. You use your own example to motivate people. The best in others… You model what it looks like to be disciplined, productive, and trustworthy out of a desire for others to exhibit those same characteristics in their own lives. When you apply The Rhodium Rule to your life, you seek the best for others by striving to be the best you can be. For me, the word “best” simply means reaching toward your potential at any given moment. When you follow The Rhodium Rule, you lead yourself in a way that actually makes other people’s lives better. You push into your potential in order to inspire others to do the same. You rise above mediocrity in your own life to show others that it’s possible for them as well. When I follow The Rhodium Rule, I will make and keep promises, not only for my own benefit but for the benefit of others. Because my own example can serve as inspiration to those who are trying to keep similar promises. I keep a promise to be honest so that it will inspire honesty in others. I keep a promise to be physically fit so it will inspire fitness in others. I keep a promise to do my work with excellence so it will inspire excellence in others. I keep a promise to build healthy relationships so it will inspire healthy relationships in others. I keep a promise to keep my promises so it will inspire others to keep their promises. The Rhodium Rule aligns with the axiom, people do what people see. If I’m not leading myself well, how can I expect those in my care to lead themselves well? 1. YOU HAVE TO DO SOMETHING. The Rhodium Rule is based on action. You can’t simply nod your head in affirmation. It must be more than belief. It requires a certain type of behavior. It’s you DOING (everyday-habitual-life-enhancing behaviors) your best to lead yourself well. 2. YOUR MOTIVE: DO YOUR BEST TO INSPIRE THE BEST. Lots of people are into self-improvement for improvement’s sake. I applaud that. When you apply The Rhodium Rule to your life, it takes self-improvement to the next level. 3. YOUR ACTIONS MUST BE OBSERVABLE. Like the Golden Rule, you cannot set an example unless people can observe your example. The Rhodium Rule only works when you live your life out loud in front of others, especially those people whom you are leading. This requires authenticity and transparency. The Rhodium Rule isn’t about being a perfect person. It’s about being a person who is making progress. It works in both the good and not-so-good moments of life. The people around you are watching how you respond to life, especially those times when life doesn’t go as you might have hoped. Your reaction and response to mistakes, failures, blunders, and your own weaknesses will help others know how to handle their own. I remember lashing out at one of the people on my team because he was pushing for a proposal that I thought was ill-advised and poorly timed. While I had years of experience over him and might have been right, I confronted him poorly. I can honestly say I was not following The Rhodium Rule at that moment. When I had some time to reflect on the situation (as well as hear from a couple other people about how stunned he was by my verbal tongue-lashing), I called him into my office. He hesitantly agreed to come in and sit down. At no point in the conversation did I offer any type of excuse for my actions. I took full responsibility for my outburst. I didn’t blame it on anyone else or on the circumstances. I offered a clear, heartfelt apology. In that moment, The Rhodium Rule was working. This was a situation where I needed to lead myself well by publicly owning up to my own failure. In doing so, I was setting an example of what an honest apology looked like. I’m reminded of how many times I told my own children to say “I’m sorry” like you mean it. It’s easier for them to do that when they’ve seen it authentically modeled by someone else. I wish I had kept my cool when I initially confronted this team member. But I didn’t and I had to own my mistake. I humbly came back to him and shared my regret and my apology. The Rhodium Rule was applied to this situation. I wanted to be the type of person who took responsibility for myself (and my mistakes). I hoped it would give him the permission to do the same if the mistake were his. When you realize that leadership starts with you, but it’s not about you, you start giving away all you can for others instead of taking all you can for yourself. Your leadership position is a platform. You get to choose how you use it. What are some ways you can apply the Rhodium Rule to your own life? How transparent are you about the ways you’re leading yourself? What can others observe in your life that inspires them? In what ways are you seeking to set an example others can follow? Would you like to see the Rhodium Rule infiltrate the culture of your team or organization? Click here to set up a time for Tim to come and train your team on how to lead by The Rhodium Rule.